Warrior Legend Manga Universe: Should I be excited? 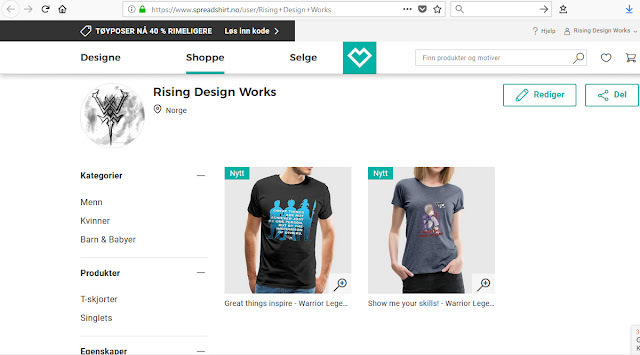 It is 18.07.18 today and the t-shirts are available, but only in Norway!! Oops! and WHY! A slight update here about the T-shirts. It has been quite a ride finding someone to do this like I want, but still, I'm not meeting my expectation! They where supposed to release today. But they are only available to my Norwegian customers for the time being. I'm finding the solution to this as soon as I have finished posting this will be solved as soon as possible. I wanted a big release today, but I have to wait until everything is in place! If you order from Norway site it can be trouble unless you live there due to sendings or other, I'm not sure actually! spreadshirt.no is an international site spreadshirts.com, but they do have some region restrictions I'm willing to work around. If you find yourself ordering a t-shirt today you are most awesome, but be sure to take care of the receipt/order confirmation and check back here on this site or on my social media for a bonus to come with the initial release that I originally had planned for today! But be sure to stick around, I'm hoping this solves up soon, your wait will be rewarded! Are you interested in how to open a t-shirt store then I'll write about that one day here on the blog, so you dont have to struggle as I did this summer!